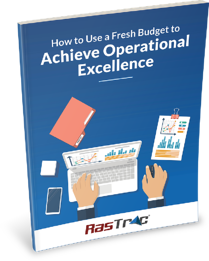 When planning a new budget, it’s sometimes hard to know what unexpected operational challenges your organization may face and how to plan for them to avoid common — and not so common — budgetary pitfalls. Rastrac has put together a useful guide to show how a fleet management or asset management system can benefit your organization, no matter what time of the year you choose to invest. Enhance the cost-effectiveness and improve your bottom line. Fill out the form to the right to learn more about how you can achieve operational excellence.